In 1939, Joe Albertson opened a 10,000 square foot grocery store in Boise at 16th St. and State St. with about 30 employees and $12,000 in his own cash and investment. The store was packed with then-novel features, like a magazine rack, fresh flowers and an ice cream bar. Now, nearly 80 years later, the retailer is opening its latest store - a grocery showplace Albertson likely wouldn't be able to fathom all those decades ago. It is nearly seven times as large as that first store, and employs 260 people and cost more than $7.2 million to build. The store at 1219 S. Broadway Ave. replaces a smaller market torn down on the same block earlier this year - and is the last Idaho store the chain owns to be remodeled or replaced in the last few years. "Joe was an innovator," Albertsons Division President John Colgrove, who worked with the company founder said. "Things like bringing a magazine rack, the household goods… it was all innovative in his time. I think if Joe saw this store today, he’d say two words: 'well done.'" The store echoes some of those themes from eight decades ago - and in fact, will open on the 79th anniversary of the first store opening - this Saturday at 10am. The location is striking in the variety of items that are not typically found in an Albertsons - or most grocers for that matter. During a tour Thursday morning for BoiseDev - dozens of employees were working on final touches ahead of this weekend's opening events. The beer and wine selection are among the largest in Idaho, according to Colgrove - including one whole rack features just rosé wines. A case of rare wines is also featured, with price points up over $700. This location is similar in shape and position to a nearby Whole Foods at Broadway and Myrtle, but Colgrove said his store stands apart. "Of course we will have the full assortment of natural and organic offerings. We also a full line of mainstream national items as well as countless local items. We’ve canvassed the entire community. There's literally hundreds and hundreds of items that are only in this store." Albertsons Broadway features more local products than the average store in the chain - and Colgrove says his team worked to source items that aren't usually available at retail from across Idaho. “They went down to the Saturday morning market and met a lot of the individuals down there that were selling their items. We asked a lot of them if they were interested in coming into the stores." Local items include Bucksnort Root Beer, MFT sauces, Teton Valley Brands Idaho Real Potato Chips and others. Albertsons Broadway features a large array of options for food. It will be the first Idaho store to feature Plated meal kits, which Albertsons acquired last year. The kits allow shoppers to grab a meal kit with nearly all the ingredients they need to cook at home. The store also has a selection of meals ready to heat and eat at home. But a unique focus is the number of options for people who want to chow down on site. An upstairs seating area with TVs, a full liquor bar and outdoor patio will give shoppers more of a restaurant experience - complete with table service. If a proposal for a baseball park to be built by Boise State comes to fruition, it will be viewable from the deck. That bar - called Broadway on the Rocks - is designed for the neighborhood to grab a bite and stay a while. "It's clean and modern, a beautiful space to hang out," Albertsons Communications and Community Relations Manager Kathy Holland said. "We are hoping this will invite people to have a drink with friends, or have dinner or grab a bite and have coffee right here in the store. It really is a gathering space in the community." A newly-hired concierge will provide a way for customers to have one contact and tie together all the various options in the store for parties and gatherings. Saenz says the service will first be marketed to local businesses for meetings and functions. A typical store aisle with the fish market and butcher block in the background. The company chose this site for a showcase store for a variety of reasons, according to Colgrove. “The store (that was here) has been here since 1959," he said. "Although it served the community for several years, the footprint was too small to keep up with the expanded categories and expanded offerings consumers have come to expect. He said the investment in naming rights to nearby Albertsons Stadium and the partnership with Boise State also played a part. "Its location next to Boise State and Albertsons stadium - we felt this was the right place for it." For a time, the company had planned to call the location Market Street Idaho - but changed course before opening. "It really came down to hearing a lot of stories from the customers of the old store here," Holland said. "They had shopped here for 60 years and remembered meeting Joe. We really wanted to keep that spirit alive so we decided to rebound this store as Albertsons but make it more distinct to this neighborhood." Colgrove and Holland said the store will likely draw from all over Boise, but they expect most customers to make most of their visits to the location nearest them - with Broadway and the forthcoming Market Street Idaho location in Meridian serving as destination stores for many. Organic produce and products have been a big consumer trend in recent years, and Albertsons Companies has rolled out an extensive O Organics brand to match. The new Broadway location will feature an "organic department to rival any store in the state," according to Colgrove. He highlights not just food products, but an extensive health and beauty section rooted in organic products and principles. "In our Living Well area, we really focused on organic and clean products," Holland said. Poke bowls made in store. A made-to-order brick oven pizza station. Customers will be able to pick their toppings and be served a hot pizza in about seven minutes. A scratch-made bakery featuring warming cases and large donut selection. In many stores, Colgove said, the bakery products are par-baked - with prep done offsite, and a final heating in the store. A carving station that will allow meats like chicken, beef and cold cuts to be custom sliced. An extensive cheese section, including products made in the building. An in-house chocolatier team, with an extensive selection of handmade chocolates. A gelato bar with fresh-served and scooped ice cream. A selection of handheld mochie ice creams. Global flavors aisle with spices and products from different culinary styles including Basque, Hispanic, Italian and more. Butcher block, featuring the ability to cook some items like salmon in-store while customers wait. Unique meat selection, including wild boar, elk, buffalo and goat. In-store dietician who can help customers with dietary needs. The service is available standalone and to those referred by a doctor. A Boise State Broncos fan shop, with apparel items. Home decor items and housewares. Albertsons Broadway opens to the public Friday, July 20th for a soft opening. A grand opening celebration is set for Saturday, with prizes, food, happy hour pricing and more all day from 10am-9pm. Regular store hours will be 7am-11pm - but during Boise State games and other functions, the bar area could stay open late. Colgrove is excited to open to the public. "I’m overwhelmed and excited about our fresh foods offerings - in particular our service deli that is innovative, clean ingredients with something for all," he said. "Joe's philosophy of innovation continues." Two years ago this month, BoiseDev broke news that Albertsons would tear down its small, dated store on Broadway and replace it with a large, 2-story showcase store. Now, an opening date is set. The Boise-based grocery giant will hold a grand opening on Saturday, July 21st, with a ribbon cutting at 10 a.m., as well as events and activities throughout the day and into the evening until 9 p.m. The store will have a soft opening on Friday, July 20th, according to a company spokesperson. The new store is nearly three times as large as the old one, which crews tore down earlier this year. "This store will have an expanded selection of hot, ready-to-eat meals, expanded fresh-cut fruits and vegetables, scratch bakery, indoor and outdoor dining so you can enjoy your meals right here," division president Brad Street said during the groundbreaking last year. "This store will be a destination for foodies; a place of food exploration, adventure and education— unlike anything this market has seen." The store will also include a Starbucks, "Broadway on the Rocks" bar area and more. The second-floor terrace is positioned across the street from a planned Boise State baseball park, and will provide visitors with views of future baseball action. The company had announced it would brand the store as Market Street Idaho - but later back-tracked, keeping the store (just a few blocks from Albertsons Stadium) under the original banner which first debuted in Boise in 1939. A similarly-formated store under construction on Fairview Ave. near Eagle Rd. is still planned to use the Market Street brand. BoiseDev has obtained the first plan for a new baseball stadium on the Boise State University campus. The site plan shows a field being constructed on Beacon Street between Euclid Ave. and Denver Ave. The Idaho State Board of Education approved up to $500,000 in funds for initial design and planning for the new field during a meeting in Idaho Falls last month. According to documents filed with that SBOE approval, the complex would include an artificial turf field, plus team dugouts, bleacher seating, press box, restrooms, a perimeter fence or wall plus netting. The site plan also shows room to park about 200 cars. The school told the State Board of Education the first phase of the ballpark would cost $8 million to $10 million. In a recording of the Boise State Legends podcast with Idaho Press Boise State beat writer BJ Rains in May, outgoing Boise State president Bob Kustra said the plan is just the first phase, and additional facilities like locker rooms and upgraded dugouts could be on the horizon. The turf for the field could be blue, an idea promoted by coach Gary Van Tol. Kustra told Rains the idea isn't out of the possibility - though the site plan shows a traditional green outfield. To pay for the first phase, the school said it would "convey two parcels of land in the Lusk District of Boise to a developer plus approximately $3.5 million in cash in exchange for development of the field and associated spaces." The document did not say which parcels or who the developer is. The Lusk Street neighborhood is quickly redeveloping with a spate of student apartment complexes and other businesses. According to property records, the Idaho State Board of Education owns two parcels in the area, the site of a former ITT Technical Institute campus and a parking lot at the corner of Capitol Blvd. and Royal Blvd. In the Idaho Press podcast, Kustra teased the development arrangement. Due to the upcoming holiday, Boise State communications officials were not available for comment. To make way for the field, about a dozen buildings would have to be razed. The school owns the most but not all of the parcels that would make up the new facility. To complete the project as envisioned, Grant Ave. between Beacon St. and Belmont St. would close, as well as Belmont St. as well between Euclid and Denver. Ted Challenger's latest venture will come to an end. The Boise bar owner purchased the former Cheerleaders Bar & Grill in 2016 and converted into The Tailgate. Now that business will fold up its rear lift door and pack away the beer and food for good. In just two years, the concept evolved from Tailgate Sports Bar & Grill to Tailgate Taphouse. The location near Ann Morrison Park was tucked away, but hoped to draft off the increased customer base from student housing built in the Lusk St. neighborhood. "We'd like to thank everyone that supported us over the last 2 years," the business wrote on Facebook. "We had some great successes and lots of fun! This decision did not come easily, but we believe it's the correct one at this time. The last day in business will be Saturday, June 30th. Just after the new year started in 2017, locally-owned restaurant and Tap & Cask replaced national chain Tilted Kilt at 1555 S. Broadway. Now, Tap and Cask has closed its doors after just 18 months in business. The large 8,300 square foot eatery featured three dozen beer handles, food and cocktails from two bars. The restaurant did not reopen Monday. T&C's Facebook page and website have been deleted. The electronic message board outside the restaurant shows "CLOSED." New taproom set for Broadway Ave.
A small new pub and taproom is on the drawing board for a shopping center on Broadway Ave.
Critty's is in the permitting process to open at 2139 S. Broadway, next to the Idaho Youth Ranch store. Future location of Critty's in Boise. Via public filing. Twenty-five taps, with mostly local and regional brews - plus some ciders and four wine taps. The pub space will have seating for about 50, and feature an area for darts and serve bar snacks like pretzels - but will not include food service. Growlers and some bottles will also be offered. When the Albertsons market closes on Broadway Ave. this year, it will be replaced by a much larger store. But in Joe Albertson's hometown, the store won't carry his name. The store will carry the new Market Street Idaho brand - as will a forthcoming location in Meridian in the former Shopko on Fairview near Eagle Rd. The Broadway Market Street Idaho store will employ about 200 people according to the company, while the Meridian store will give jobs to 300 folks. The Broadway store is expected to open this summer while the Meridian store has a late-year timeline. The existing Broadway Albertsons is now slated to close in April, leaving a gap of a few months without a store in the neighborhood. Promising exclusive culinary delights and unique dishes, the Treasure Valley’s two Market Street Idaho stores will encourage customers to hone their inner chef through in-store culinary events and classes as well as time savers like catering services, an in-store restaurant style food court and other gourmet creations fit for the most discerning customers. “In our Market Street Idaho store, our dedicated chocolatier might partner with one of our scratch bakers to create an art deco cake for an exclusive event, or our Head of Catering might work with our sommelier and masters in our fresh team to craft an exclusive wine pairing experience with fresh fruits and cheeses. We’re elevating the idea of what a grocery store can be here,” said John Colgrove, president of the company’s Intermountain division. The Market Street name and concept are also used for a chain of stores the company acquired in Texas in 2013. Renderings for the Broadway store show a second-floor Talon Taphouse, as well as in in-store Starbucks. The old Beach Club Tanning Salon on Beacon Street is going to the dogs. Veterinary Wellness Centers has applied to convert the 1800 square foot space for routine checkups, vaccinations and minor injury care. "Veterinary Wellness Centers' goal is to simplify veterinary medicine. The majority of veterinary outpatient visits require relatively low overhead and only a basic facility to achieve their objective. Following our model, we will make delivering veterinary care cost effective, efficient and pleasant for pet owners who want to give their pets the care and comfort they deserve." The clinic will have dog and cat exam rooms, radiology, a lab and pharmacy and a ward for animals. The project has to get a conditional use permit from the City of Boise, and that process is underway. The large reader-board display for Boise State University on Broadway Ave. near the Boise River has seen better days. Members of the Boise State Spirit Squad pose in front of the sign in December, 2015 - just shortly before it was turned off in time for reconstruction of the Broadway Bridge. The sign still carries a logo replaced by the school in 2012, and has seen its digital reader board turned off since early 2016. A new, updated sign will feature a more contemporary look, with enhanced digital display board and current branding. 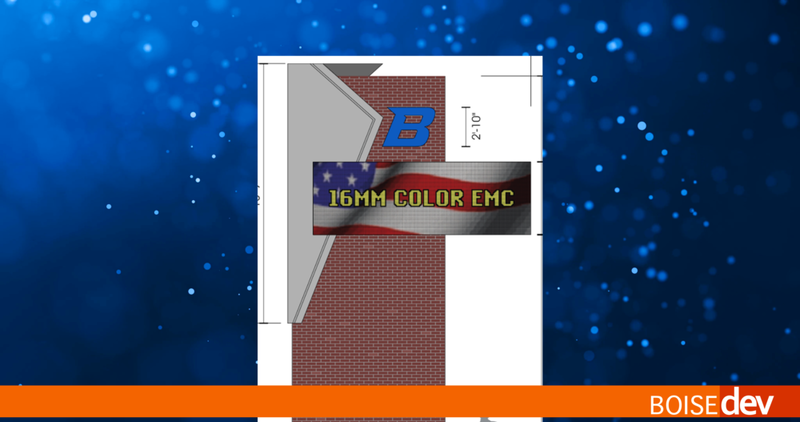 Boise State University Associate Vice President of Communications and Marketing Greg Hahn says the new sign " is designed to reflect the campus look and feel through the brick pattern, which can be seen across campus, and that silver/aluminum accent from buildings like the student union building and environmental research building." The updated sign is proposed to be slightly taller - 30' 11" versus the current 26' structure. It will be slightly less wide, 17' 7" versus 21' 4" currently. The inset reader board would also be slightly larger. Hahn notes the digital board won't feature video images - just stills - due to its placement on Broadway Ave., which is a state highway. "We have used it in the past to advertising big events on campus, Morrison Center, Taco Bell, athletics, big days on campus," he said. The sign must pass the permitting process with the City of Boise. The marquee originally had a twin on Capitol Blvd. near the Towers Dorm. Both signs were originally sponsored by First Security Bank which covered installation costs totaling about $160k per sign, according to the Arbiter in 1984. The Capitol Blvd. sign was removed as part of a push to improve the visual coridoor from the Boise Depot to Idaho Statehouse. See a photo of the marquee shortly after installation in the Boise State photo archives. Einstein's Oilery has applied to open a location on Broadway Ave. near Highland St. on the current site of a beauty salon. The application with the City of Boise calls for a new drive-through quick lube spot, which would be the chain's 8th in the Treasure Valley. The existing Blondie's Hair Salon would be torn down and replaced with a one-story oil change building with basement, if approved. Boise's old firehouse six may soon have a new tenant: a brewery. Bear Island Brewing Co. has filed for a conditional use permit with the City of Boise to convert the former fire engine bays into a brewery and taproom. The former fire station on Fairview Ave. at Liberty St. has served a variety of uses since being decommissioned as a fire station. Now, two large garage doors that were removed are planned to be added back to the building as part of the remodel and upgrade. Bear Island distributes a variety of Idaho-themed ales that are currently brewed out of a garage operation. The Bechtel-Westover family owns the business, and serves its brew on tap at restaurants like Juniper, Cottonwood Grille, Cobby's and others - as well as at retail growler stations around the valley. The current lineup of beers includes Carriage Ride, Idaho Potato Ale, Fuse, BearFaced and Kolsch Royale. “Our official statement on this is that it is premature as it is still in it's infancy (this building has not been fully vetted yet and requires extensive permitting and approvals). We promise to make an announcement ourselves if we are moving forward with this or any other building. We will know more in December, until then thank you for your continued support and keep your fingers crossed!" Cheers, Beth Bechtel, CEO, Bear Island Brewing Company. First a fence, now a crossing: new light headed for Capitol Blvd. After the installation of a fence on Capitol Blvd. between the Lusk District and the Boise State University campus, ACHD is changing tactics. Crews are set to add a pedestrian crossing at Island Ave. that will be activated only when people on foot push a button and request to cross. Work is underway now, the new signal is slated to be finished in November. Student population is booming in the Lusk area - the new crossing will join a new crossing at Royal Blvd constructed last year. Is Boise Ave. getting Mom's Diner or no? On August 3rd, the Idaho Statesman wrote up a feature on the apparently-forthcoming Mom's Diner. The owners said it would open soon, and in fact they wanted to be open by July. But, according to a leasing flier posted just eight days later, the space on Boise Ave. is for lease - and won't become home to Mom's. The restaurant location at 1211 Boise. Ave. has seen a parade of restaurants in recent years - most recently the Franco's Pizza concept. Extensive remodel work has stopped and a large for sale sign is now outside the building. Mom's left a comment on its Facebook page to an inquiry saying "We are down but not out." We've reached out for comment, we'll let you know what we hear. The building is listed for sale at $439,000 - with lease options also available. UPDATE: A prior version of this story used different budget figures provided to BoiseDev by the City of Boise and confirmed on a CCDC document. Story updated with latest information. The City of Boise and Capital City Development Corporation are preparing to put public money toward the vision for a fixed-rail streetcar in Downtown Boise. During a Monday meeting, the CCDC proposed to spend $2.3 million during the 2018 and 2019 fiscal years - which would be partially matched by $1.2 million coming from the City of Boise's general fund - for a total of more than $3.5 million of public tax dollars. The money would be used for engineering of the roughly 5-mile streetcar line - and is only the first step in a project that could cost well more than $100 million if built. Despite mixed public feedback and a circulator committee that did not advocate specifically for rail, Boise City Council in April voted to move forward with the fixed-rail concept. The City has a request for qualifications out for "professional services consultant... focusing on advancing the Downtown Boise Circulator project." Two firms responded and a final award has not yet been made, according to public records. City of Boise Communications Director Mike Journee said the city is currently working to put together financing on the rail project - which could include federal dollars. "We are in the pre-application phase," he said. "We are working with consultants and others to understand our financing and understanding and we can enter into a small starts grant program," he said. Journee said that while the City Council advocated for fixed-rail, city staffers are also looking at potential ideas like autonomous vehicles. "(Staff are working to) Identify and evaluate areas of concern and potential challenges and monitor and explore emerging technologies," he said. One member of the city's circulator steering committee and prominent Downtown Boise developer Clay Carley told BoiseDev earlier this summer he is not in favor of a rail-based solution - and would rally his peers to "vote against" any such effort. He instead advocated for an autonomous bus or similar solution. For the City of Boise, Journee says the public feedback window has for now closed - and that the City Council has approved the rail plan. A process over one-to-two years will play out that includes the funding piece. The public has a chance to attend a public hearing for the Capital City Development Corporation on Tuesday August 29th at noon to weigh in on the budget outlay. Any final say on a fixed-rail streetcar ultimately lies with the Ada County Highway District, which controls the right-of-way for all streets in the county. Trump & transit: How will Federal shifts affect Boise's Circulator idea? 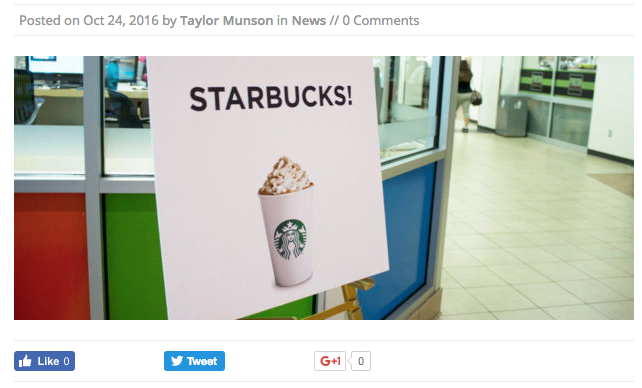 The new Starbucks in the Student Union Building will be Idaho's largest, according to a news release from the school. The coffee and quick foods retailer officially opens its doors today, and will gobble up 2,200 square feet of space. Regular operating hours, beginning on move-in day Aug. 18, will be from 7 a.m.-11 p.m. Monday–Friday and 8 a.m.-11 p.m. Saturday–Sunday. Moxie Java's presence in Boise continues to dwindle - with an outlet on campus at Boise State going the way of so many others. Boise State and food vendor Aramark are reshuffling some of the space inside the Student Union Building, which will make way for a new Starbucks outlet - while the Moxie will close, according to The Arbiter. 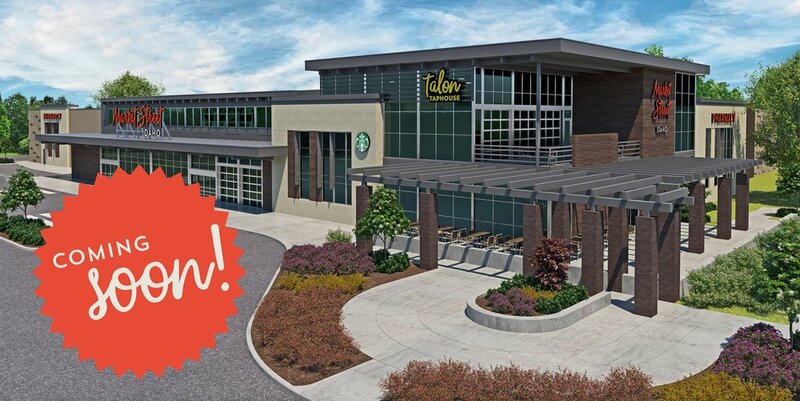 This will be the second Starbucks location on campus - the other is inside Albertsons Library. Garden City-based Moxie Java used to be the dominant coffee player in Boise - but has been reduced to just a handful of locations, and is now behind Starbucks, Dutch Bros. and Human Bean in number of total locations. Another local Moxie also recently closed. Yeah. It's already time to start thinking about that scary fall holiday. Spirit Halloween rents empty storefronts for a few months around the October 31st holiday each year to sell costumes, wigs, face paint and the like. This year, according to filings with the City of Boise, Spirit plans to haunt the former Shoe Carnival store at 303 N. Milwaukee St. as well as the former St. Vincent de Paul Thrift Store location on Broadway Ave. near Iowa St. This will be the company's second year in the Milwaukee location. Stores should open around August 15th, according to Spirit's website. The company often opens stores in Meridian and Nampa - though filings for those locations aren't readily available. Drivers on Broadway may have noticed the Flying Pie Pizza location on Broadway in Boise has been closed for most of the month of June. The location will now be branded Flying Pie Bistro, and include a different menu offering from the chain's other locations in the area. It will also now feature table service instead of counter service - and the restaurant staffing has been adjusted to meet the new model. The opening date for the restaurant has been a bit of a moving target. The sign originally said July 24th. Then a Facebook post said July 26th. Now, the restaurant is doing a "VIP" opening through Sunday. Food is free, but folks have to sign up for an invite. The new store will be revamped to feature Chili's current store design, similar to this location. Photo via @Chilis. After the closure of the Chili's on Franklin Rd. in Boise earlier this summer, the franchisee is turning its attention to the location on Broadway Ave. The popular game day stop has seen better days - and exists largely as it did when it opened in the 1980s. The $200,000 revamp will revamp both the interior and exterior spaces according to filings with the City of Boise. The number of seats will be increased by about ten percent - from 192 spots to 216. A source says the new look will mirror that of the chain's Twin Falls location. The faded banners at Albertsons Stadium on campus at Boise State are being updated. Boise State President Dr. Bob Kustra first mentioned the update during an Albertsons news conference last month. The communications folks at Boise State passed along this image this morning taken from the Alumni & Friends Center on University Drive. The new signs keep the dominant blue color but update the design. We'll be on the lookout for the second banner soon. The Broncos open the season at home against Troy on September 2nd at 1:45 p.m.
(Disclosure: Day365, which operates this site, has a content marketing agreement with an individual department at Boise State - unrelated to the athletics department or university as a whole). The updated Broadway Bridge over the Boise River opened to much fanfare last September. Now its predecessor (and predecessor's predecessor) have a permanent tribute. A piece of the 1956 bridge has been placed in Julia Davis Park adjacent to the new structure. A plaque for the bridge drops a little bit of knowledge - that the old structure was actually two separate bridges "so closely aligned they appeared as one." Another plauqe is dedicated to the first river crossing in this location - an 1891 bridge once touted to be "one of the finest bridges of its kind in the Pacific Northwest." The display is sponsored by ITD and the Boise City Department of Arts & History.